If I am an organizer of Kaun Banega Crorepati, I will ask the following question as the last question. Polynomial - You spend significantly more amount of time than me, but, you will do it. Exponential - I spend couple of mins, and your whole life is not enough to calculate the output. 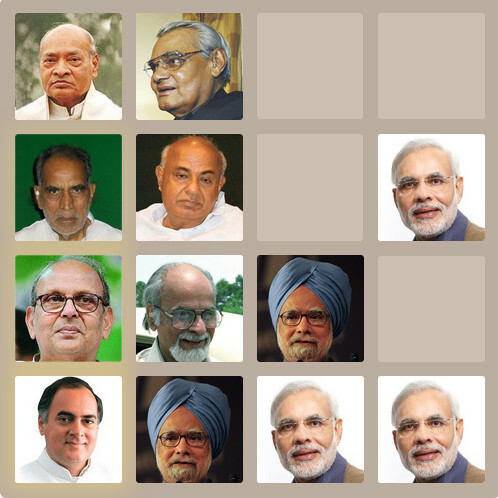 In mid 2012, when Pranab Mukherjee was contesting for the president, Finance Ministry was taken over by Manmohan Singh. Many business analysts said that, good time for the markets had started, since Finance Ministry was now going to be managed by Manmohan Singh. I could not understand how could things change, since Manmohan Singh was PM and he was anyway superior to the Finance Minister. Later on I asked myself, how many times, I changed my code just because my manager told me so. Especially, if the manager was the one whom I mentored some time back, but, now became my manager for various different reasons. The following in the book, The Accidental Prime Minister by Sanjaya Baru, has given me some insight on this. In March 2012, he (Manmohan Singh) was not even aware till the day before the budget was to be presented that his finance minister Pranab Mukherjee was going to introduce a new corporate tax policy, with retrospective effect, that would have disastrous consequences for investor sentiment. Cellular mobiles are indeed a sign of progress, but what matters to the poor is a village telephone that works. - P.Chidambaram on Jan 18th, 2004. If we cannot have smaller states, we could have smaller, and viable, units of administration that are charged with the sole responsibility of delivering these public goods. A mandal or a panchayat samiti is too small for these purposes. A district as the unit seems more viable and governable. Today, at the district level, the entire administration is in the hands of bureaucrats. It is time to ponder over an alternative model - fully elected district administrations, responsible for the delivery of selected public goods and answerable to a district-level assembly of elected representatives. The result is that there will be 5,000 units of administration, but the people may also get water, roads and sanitation. In earlier columns I have argued for rejecting the phobia about 'foreign' money. I wish to make another controversial suggestion. Perhaps, for a certain period of time, we should be colour blind to 'black' money if invested in certain sectors. Consider tourism. That is one sector which has almost infinite potential. Every additional tourist who comes to India has the potential to create at least two additional jobs. Can we not agree on a policy that allows for a period of ten years new investment in the tourism sector - hotels, luxury coaches, spas and treatment centres, sports facilities for skiing, sailing, surfing, hiking, mountaineering and golf - and promises that no questions will be asked about the source of funds? Agreed, there is an element of inequity in this proposal and the means are somewhat dishonest, but this is perhaps one of the better examples where the ends would justify the means. Von Neumann is a famous Physics Professor. He was a scientist in the first generation of atomic energy. Once in a party, a beautiful lady asked him a difficult question. The following was the question. Two cyclists are at a distance of 30 Kms from each other. Both are cycling towards other with a speed of 15 kms per hour. After one hour both reach the middle point. When they have started, a fly also started along with the first cyclist at 20 kms per hour, and touched the other cyclist, and returned to the first cyclist and after touching him again went to the second cyclist. It was doing repeatedly till both reach the middle point. How much distance did the fly travel? This kind of problems are difficult to solve. Since, the distance needs to be traveled by the fly is reducing gradually. This has to be done by using infinite series, and that would take lot of time to solve. Von Neumann told the answer in half a minute. There is a trick in this problem. If we think the problem in a different direction, it would be easy to solve. The fly is travelling at a speed of 20 kms per hour. It traveled for one hour (since it took one hour for cyclists to reach the middle point). So, the total distance traveled by the fly is 20 kms. Then the lady congratulated him and told him that, she thought he would take lot of time in solving the problem by using infinite series, but, he found the trick easily. Then Von Neumann said, "I solved by using Infinite series only. Is there any simpler method?" The following are three different paragraphs written by a famous personality (May be in different contexts). First and third paragraphs are very popular, but not the second. We were married in his house in Bangalore with only our two families present. I got my first silk sari. The wedding expenses came to only Rs.800 with him and myself pooling in Rs.400 each. I went to the US with him after marriage. He encouraged me to see America on my own because I loved travelling. I toured America for three months on backpack and had interesting experiences which will remain fresh in my mind forever. Like the time when the New York police took me into custody because they thought I was an Italian trafficking drugs in Harlem. Or the time when I spent the night at the bottom of the Grand Canyon with an old couple. He panicked because he couldn't get a response from my hotel room even at midnight. He thought I was either killed or kidnapped. In 1981, He wanted to start a business. He had a vision and ZERO capital. Initially I was very apprehensive about him getting into business. We did not have any business background ... Moreover we were living a comfortable life in Bombay with a regular pay check and I didn't want to rock the boat. But he was passionate about creating good quality software. I decided to support him. Typical of him, he just had a dream and no money. So I gave him Rs 10,000 which I had saved for a rainy day, without his knowledge and told him, This is all I have. Take it. I give you three years sabbatical leave. I will take care of the financial needs of our house. You go and chase your dreams without any worry. But you have only three years! Whenever I discuss about the complexity of programs, most of the times, I drain all my energy in few minutes (because of talking in very loud voice). The following example is very famous. Is it linear, polynomial or exponential? If anyone says the above program is linear or polynomial, I am ready to spend 10 seconds of my time in giving the input. Are you ready to calculate the output? Few days back, I have travelled by Ola Cabs for free. If an existing customer refers another one, then both gets Rs.300 which can be used when they travel by Ola cabs. Now, they have reduced it to Rs.100 from Rs.300. If you have not registered with Ola cabs, I am more than happy to refer you. You would get Rs.100 discount, when you travel with Ola cabs. My referral code is H9JH6Q. Giving incentives to the consumers to market, is one of the most efficient ways of marketing. As a consumer, I prefer that kind of marketing than any other marketing, since, instead of spending the money for TV Channels, actors and sports people, they would be spending it on me. Let's suppose, if Ola cabs introduces an incentive system where for the referrals that I have done, the person who referred me also gets some benefit, then our Indian government may file cases against Ola cabs, and there would be many "so called" social workers, who would pursue cases against Ola cabs, saying, they are cheating people and charging exorbitant prices. If anyone thinks that, they are charging more money, they do not need to buy services from them. Whoever is buying the services, knows basic mathematics, and can find out which one is cheaper for the quality that they are getting. Most of the people do not need somebody else to come and teach basic mathematics. In free market economics, there is practically no meaning to fighting against a business in their marketing. If anybody is fighting against any business for their marketing in free market economics, it only means, they have some self motives to destroy the business to reduce the competition or has individual vengeance on the owner of the business. Unfortunately in India, people use the name, "Social work" to kill the competition or to take revenge in these cases. I am talking about Amway. I got frustrated with the people who file cases against Amway, when they never lost anything or lost because of their incapability in doing the business. I am also frustrated with the people who support these "so called" social workers. If someone does not know how to run the business and start a business, then they are bound to lose the money. And, if they file cases against the producer of the goods for their loss, it is completely ridiculous. Humans can't be trusted because they're bad... so we need human overlords with concentrated political power to protect humans from other humans. What about this concentration of power? Isn't that dangerous? No... we must ensure that only good people get into that position of power. Through democracy. The majority will decide which overlord gets in a position of power. But didn't you start with the premise that a majority of humans are bad? So doesn't it follow that the majority will choose someone who'll allow them to further their bad agenda? The meaning of democracy is, those whoever is supported by the majority would rule everyone. The meaning of vote is, you like somebody, and you feel, if that person is going to govern you, you would feel happy. If you are voting for someone, it means, you would feel happy for everything that he/she would do after getting power. Once the person whom you voted wins, you will not have any right to criticize him/her for five years. If that person has done anything wrong, you have to criticize yourself for electing that person. It is your responsibility to take all the precaution to vote for the best candidate next time who will fix all the mistakes that this person has done. If you are voting for someone, and you are criticizing the same person, it means you are a biggest hypocrite. If you are not voting for anyone, it means, you don't care about anything. So, you don't have right to criticize anyone for anything. Many people severely underestimate the power of single vote. There are plenty of instances, where government brings few GOs just before the election, just to get thousand votes. Many political parties worry about other parties which splits their hundred votes. Even if one does not win in the election, but, by the votes they can get, they can bring the change in the system. Let's suppose, there are two parties A, B. A and B are corrupted parties in different ways. But, educated people prefer A and uneducated people prefer B. Now, a new small party C joined. C proposes all the development and brings awareness in all the educated people. Now, few educated people started moving to party C. At this time, A fears about this, and starts talking about development instead of freebies that it was talking all the while. Eventhough, C is negligible from the statistical perspective in terms of vote share, but, it brought change in A. That is a win for the country. If nobody is going to care for C, and if A does not see any threat from C, then, A may not talk about development. C could bring fear in the existing political parties with that little vote share. But, that little vote share is very important. Without that, there is no change. Finally, the speech of Dilip Sankarreddy (http://www.loksattavideos.com/2013/02/talk-by-dilip-sankarreddy-at-pecha.html) on what would he do, if he does not win in the elections should clarify, why that single vote is very important. I want to make it very expensive for the other political parties to compete. They are right now eating lot of money and also splurging lot of money in campaigning. I want to make them splurge lot more than what they are splurging. I want them to feel the pinch. Even if I don't win, if they win, I will make it very hard for them to make money. So, they will be splurging lot more than what they are doing right now, and in addition to that, they will not be able to make more money than what they are doing right now. That means, the business of politics will not be so opportunistic any more. So, they will have to find out something else to become rich quickly.